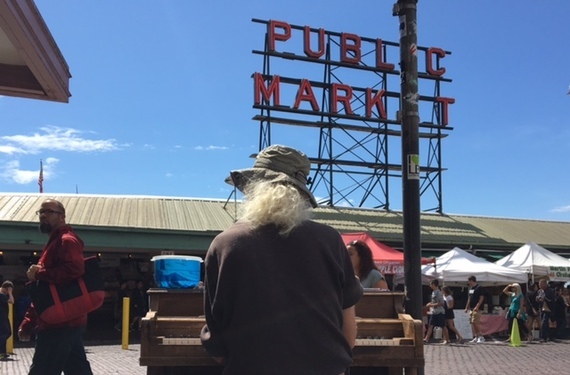 A busker wandered the streets of Portland for the Weekend Market. This summer I am working on a Busk Across America trip. Follow along here. By far, the longest (and most eventful) leg of my Busk Across America trip was street performing up the West Coast through California, Oregon and Washington. Busking can potentially expose performers to hundreds of people a day, depending on the foot traffic and day of the week. Below are personal accounts of some of my quirkiest West Coast interactions, forever sketched in my memory to be repeated at family gatherings and friends' birthday dinners. During a baseball game outside of Petco Stadium in San Diego, a group of drunk young men thought it would be a good idea to surprise me with a group hug mid-song. I don't enjoy being interrupted while I'm playing in general, let alone with a group hug from strangers. You wouldn't interrupt a doctor during surgery with a surprise hug attack, right? Work is work. The scene ended with a lot of shouting on my end and hurt looks on the other. A fellow busker showed me a secret place in Santa Monica where performers don't need a permit. In Santa Monica (which is also the end of Route 66), I got booted off the boardwalk because I didn't have a permit. 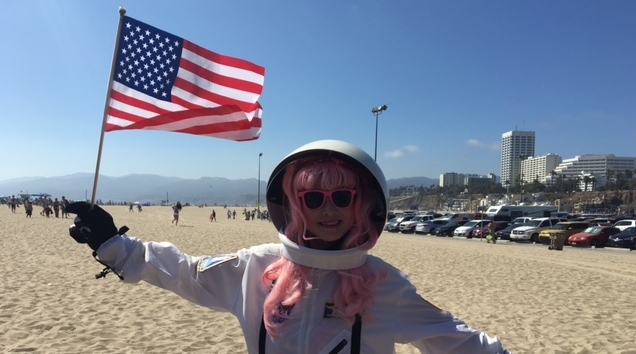 A fellow busker who was dressed as an astronaut took me to an entrance by the sand where I could play without a permit. After about 15 minutes, another local busker started setting up feet away from my spot. When I asked him what he was doing, he said he had fought for the rights of the sand and I had not. He was quite thorough with edging me out. I packed up soon after and spent the late afternoon pouting at some tourist trap taco shack. A man on Hollywood Boulevard told me about how he was brought up on the road -- literally. He explained how he was born on a bus and traveled around constantly with his musically inclined family. We spoke about what it's like seeing the whole country and about playing for people who don't always appreciate bringing music to public spaces. Before parting ways, he watched the passersby and laughed. "Look at them," he said, pointing. "They're all the same as ants and don't know it." Also on Hollywood, while singing "No Diggity," a homeless man smoking hash joined my act (without permission), adding an aggressive dance and loud, out-of-tune vocal harmonies to my performance. It was a challenge to finish the song -- I was very distracted. He asked me if I could play a song that catered to his falsetto range. After hearing his lower register, I wasn't keen on this idea and declined. He walked away with a defeated look, but periodically peeked his head around the corner, again trying to get me to play a song for his falsetto range. A busker dressed up as a giant clown swayed to my music outside of the Weekend Market in Portland. I asked him what he was up to. "Keeping Portland weird," he said. When people asked to take a picture with him, he would say: "Only if you tip her." He refused to take a portion of my tips even though his large costume's presence attracted most of the customers. While busking by Seattle's Space Needle, a listener decided to watch me play from behind a bush instead of the more common sidewalk view. He would duck his head every time I tried to wave at him. I never actually saw him leave, so I kept an eye over my shoulder as I walked out of the park. 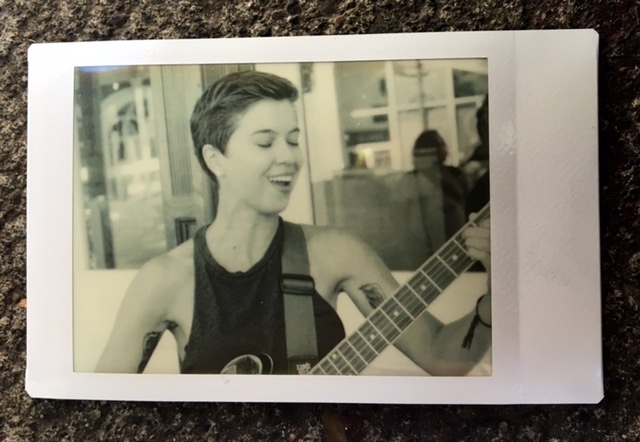 In Portland, a listener took a Polaroid photo of me performing and printed it out for me on the spot. Local artwork in San Diego; weed on Hollywood Boulevard (relax, I didn't say I smoked it); polaroid pictures (printed on the spot!) in Portland; more weed in Santa Monica (cool it with the green, California); a Bob Marley bracelet in Los Angeles; cold-pressed juice from Portland vendors; car charger in San Diego (don't have a car, but it's the thought that counts); dinner in Los Angeles; bottled beer in Portland (that I may have drank on the street while playing...); and a heart-felt book in Seattle. A man set up his piano in the busy Pike Place Market in Seattle. The best open mic night I attended on my trip was San Francisco's Hotel Utah Saloon; San Francisco's BART train (a lot of people complain about how loud it is, but to me it was a sweet blend of noise/natural music); Pike Place Market had the best buskers that I've seen on the West Coast; the most aesthetically pleasing drive I've ever experienced was driving up the Pacific Coast Highway; snow-capped mountains in Oregon and Washington -- looking at them is like hitting a mental "reset" button; and it's always surreal to look at the Pacific Ocean for the first time -- for me, that happened in San Diego. Are you a musician? (as I hold my guitar); Can you play the Mario Kart theme song? ; Can I buy your guitar? ; Are you an actress? ; If I give you $20, can you watch my car for an hour? ; Can you play me a country song? ; several Vampire Weekend requests; Can I have your number so I can give it to my brother? ; and how long have you been homeless?